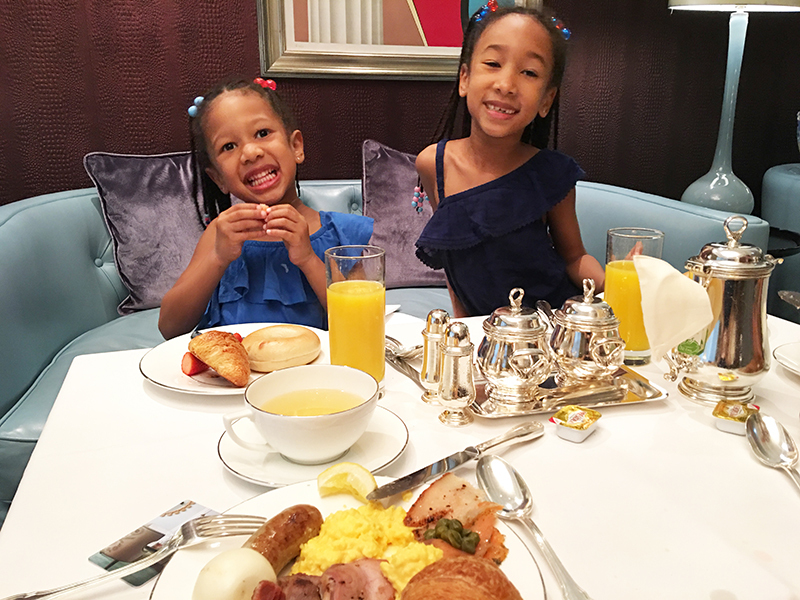 If you’re traveling to Hong Kong with kids and want to find a luxury hotel that has an intimate, residential feel, be sure to try out The Langham, Hong Kong. This property is fantastic at catering to families and is sure to feel like your home away from home. Located right near the Star Ferry and Tsim Sha Tsui promenade, it’s a great location for sightseeing. 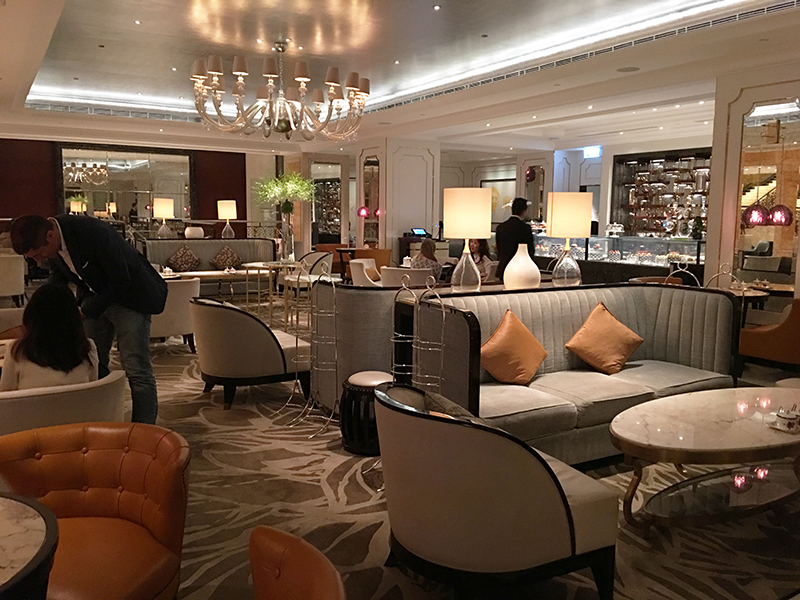 After making our way through the busy Tsim Sha Tsui district, stepping into The Langham felt like entering a whole different dimension. 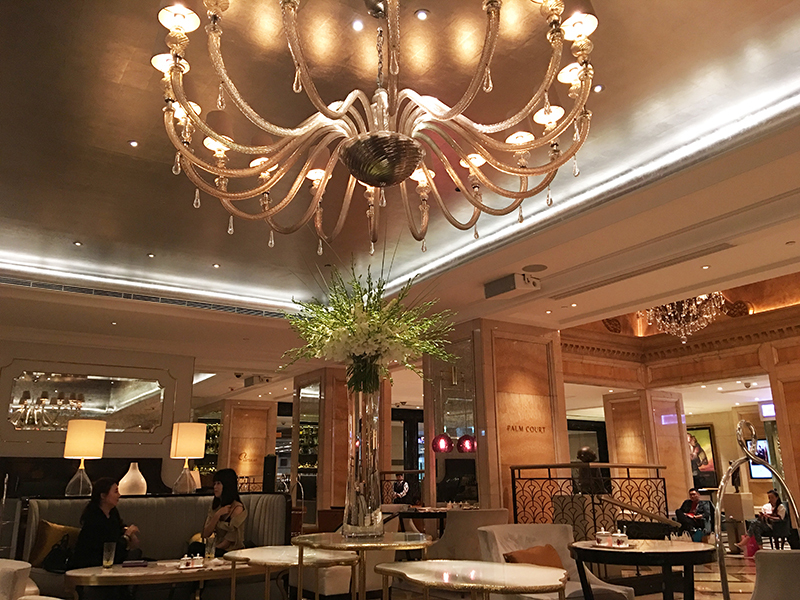 The elegant lobby has a classic, old-world feel. 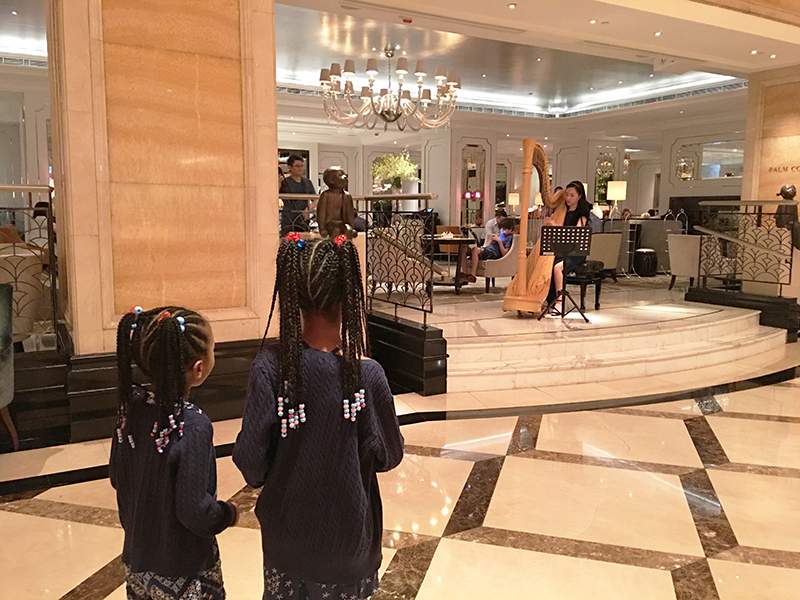 Our girls were immediately mesmerized by the beautiful music the harpist was creating. The hotel also smells wonderful. Some hotels overdo it with scent, but The Langham disperses just the right amount of its signature ginger flower scent to make guests feel immediately relaxed and at ease. 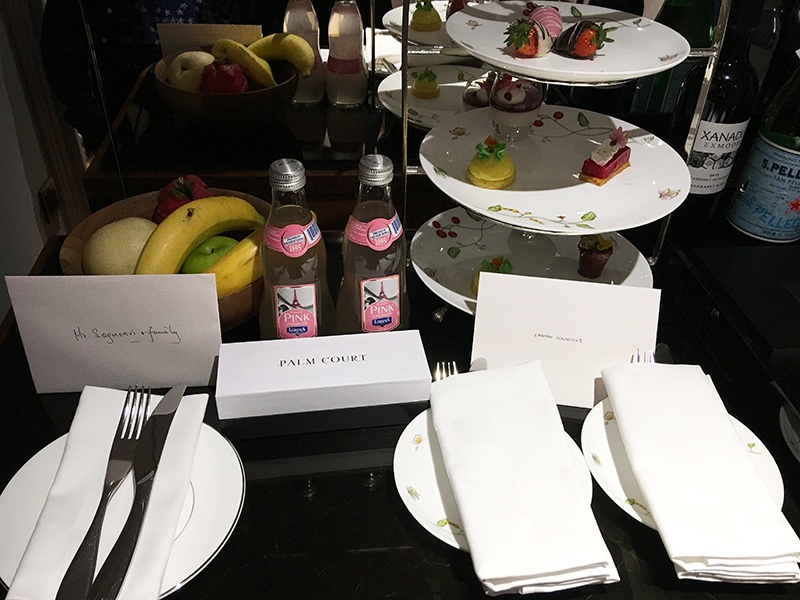 One of the team members at The Langham showed us up to our room, where we had a lovely private check-in experience. We stayed in room 1438, a one bedroom suite, which at nearly 600 square feet, felt like our very own luxury apartment. That’s not surprising, since one of the defining characteristics of this property is that it’s designed to feel like a private residence. 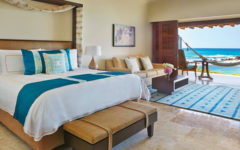 This suite was truly one of the most beautifully decorated rooms we’ve ever stayed in: everything from the silk-covered walls to the touches of robin’s egg blue, from the well-thought-out accessories to the gorgeous variety of textures. The hallway leading from the living room to the bedroom was lined with closets, so there was plenty of storage space for a family of four like us. 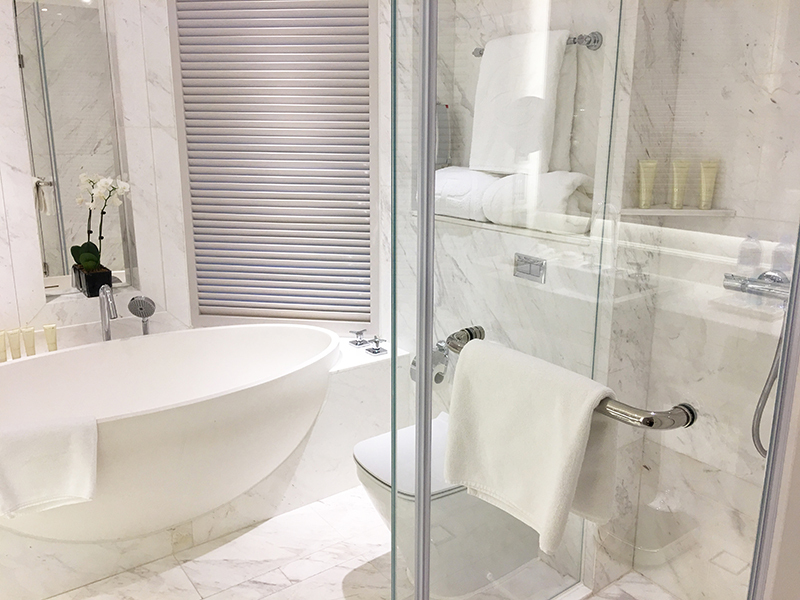 The all-white marble bathroom was just gorgeous. Getting ready in here each morning felt like a spa experience. In the kitchenette, we found a lovely welcome platter of sweet and pastries, which would be a nice preview of the afternoon tea we would experience later. 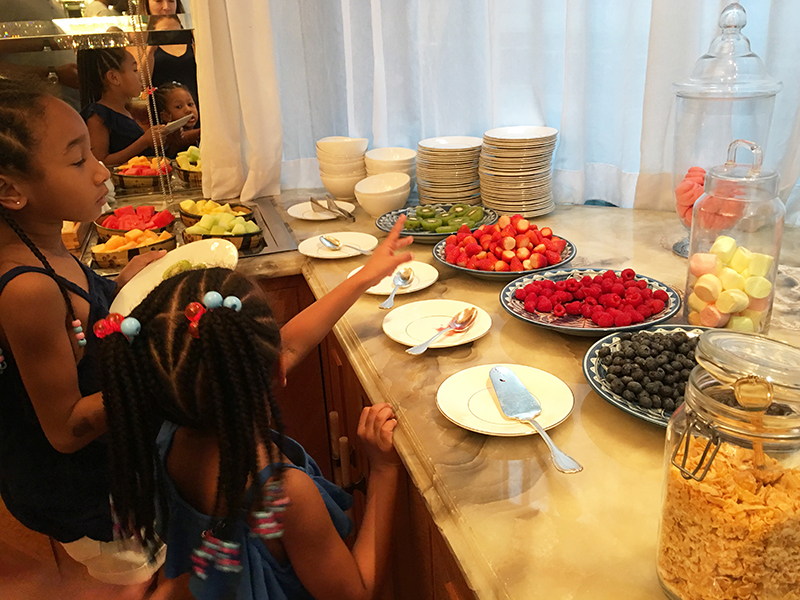 As a parent who’s always trying to get my kids to eat more produce, I also appreciated that the hotel provides a fresh fruit bowl that is replenished daily. 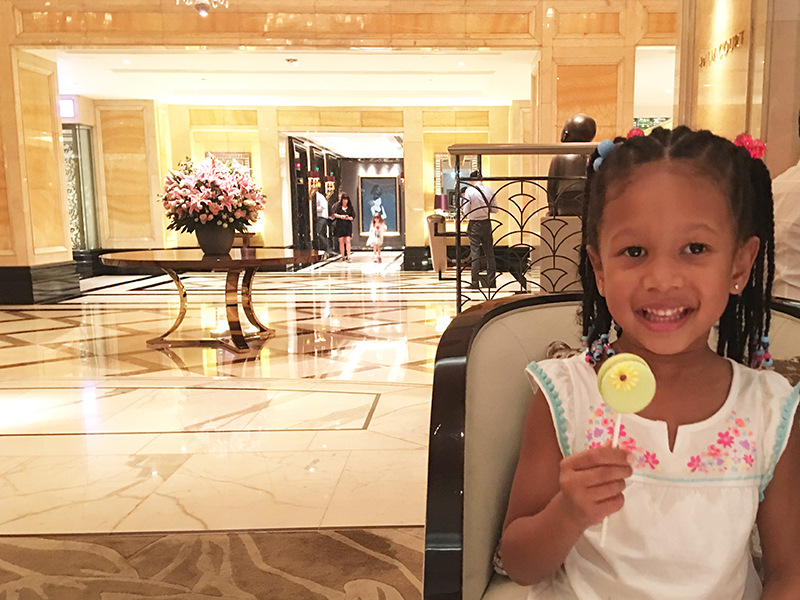 The Langham knows how to make its littlest guests feel special. 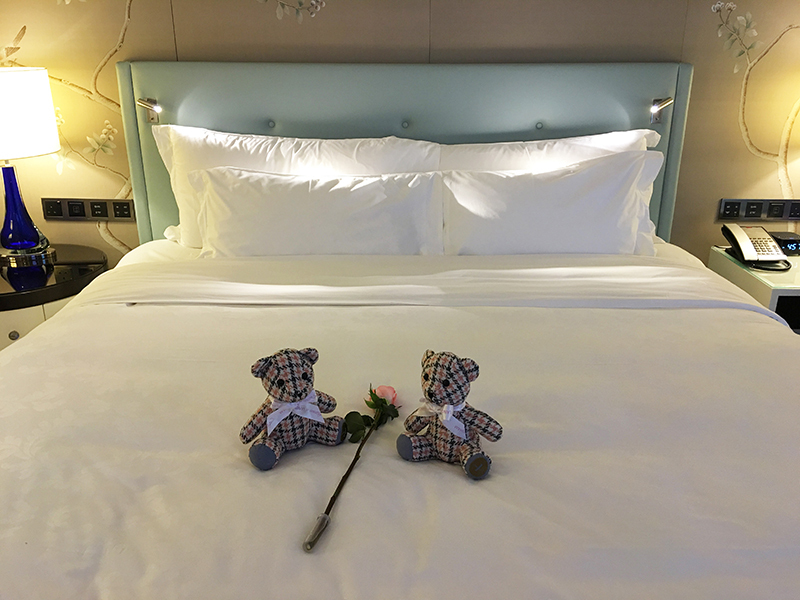 There were two adorable little pink and grey teddy bears for our girls, along with a pink rose. 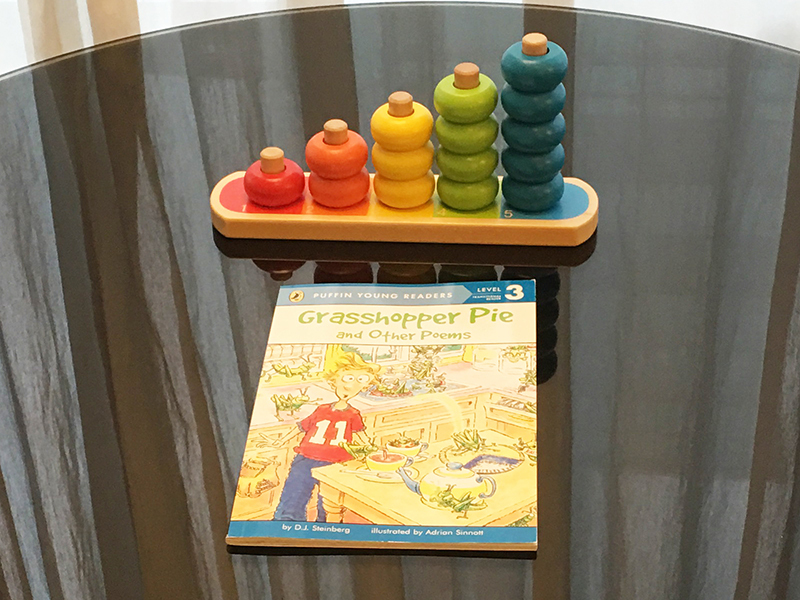 In the living room, the property had placed a stacking toy for our younger daughter, and book of funny kids poems for our older daughter. Long after we returned home, this book has remained a favorite of our girls! 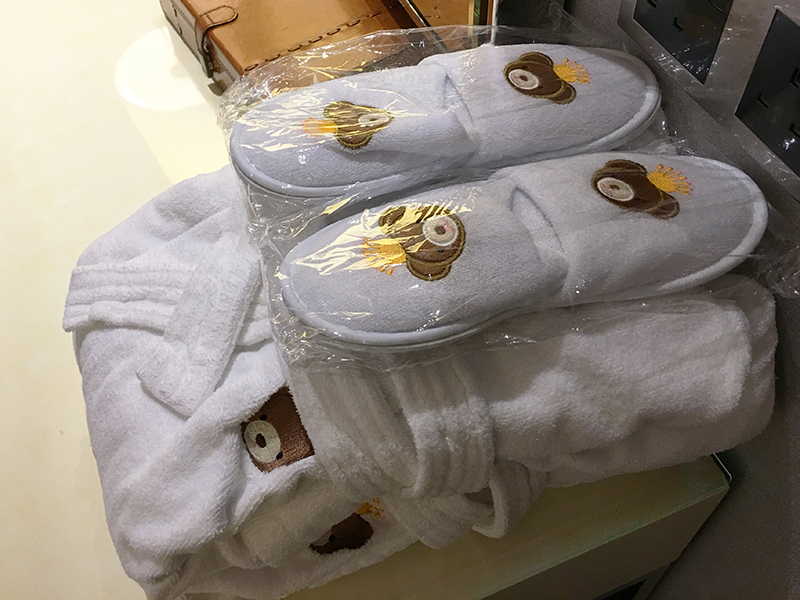 The hotel also left kid-sized robes and slippers for our girls, emblazoned with the cute Langham teddy bear. 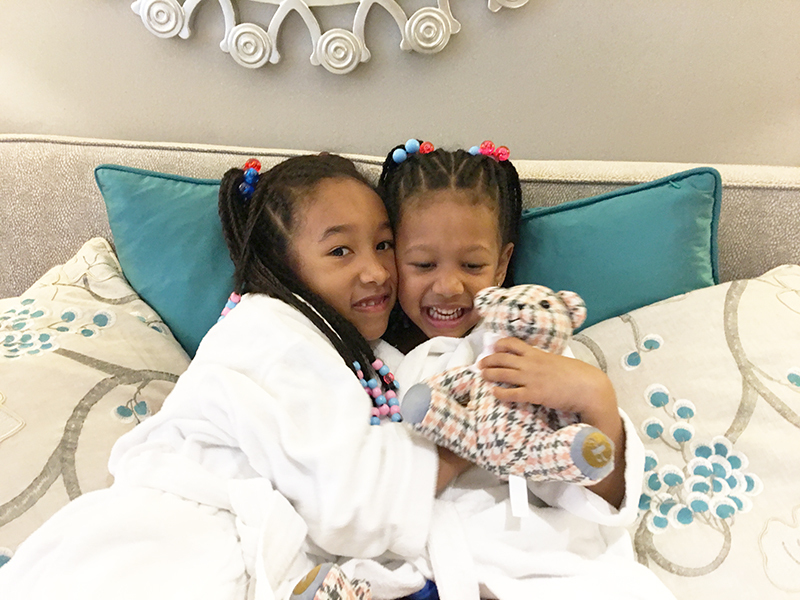 Our girls absolutely loved all the kids amenities. They felt right at home. 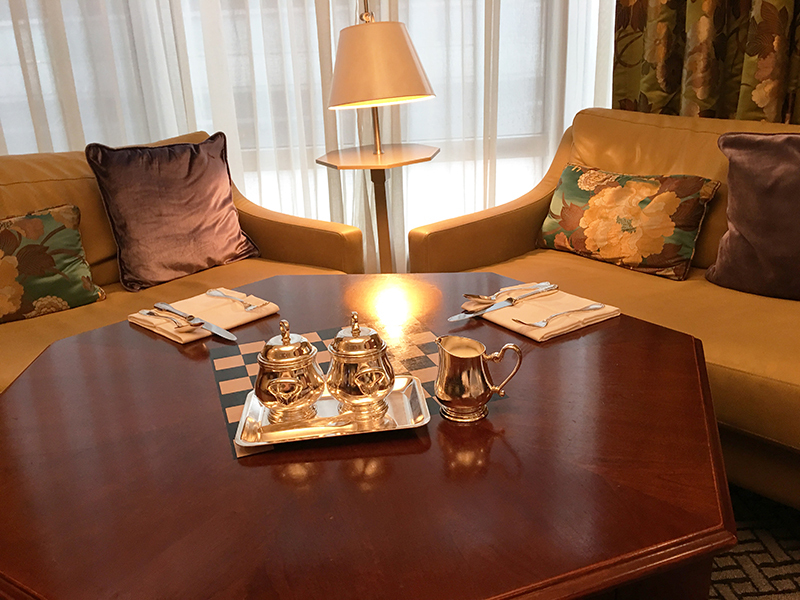 By far the best part of staying at The Langham was the wonderful hospitality we received at The Langham Club, the hotel’s club lounge. 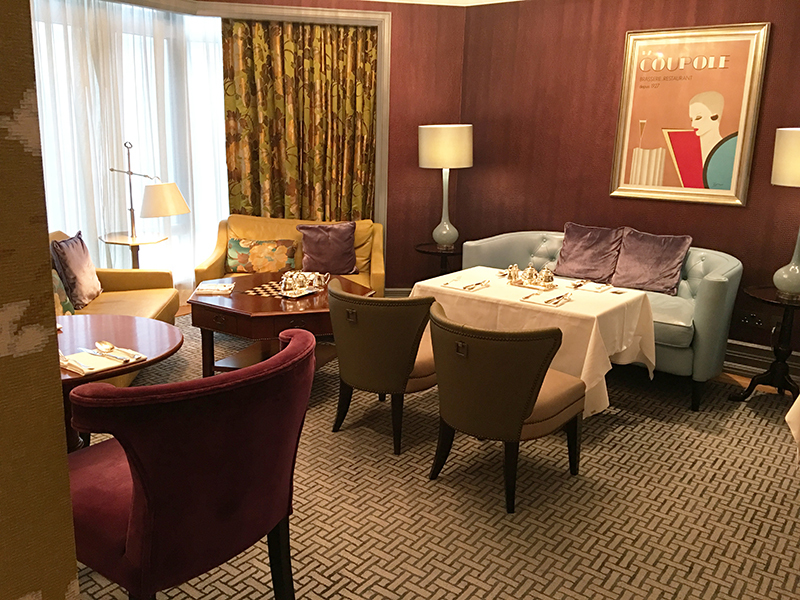 Elegant yet comfortable, spending time at the cozy club felt like hanging out in a well-heeled friend’s living room. The Club has three different seating sections, connected rail-road style. 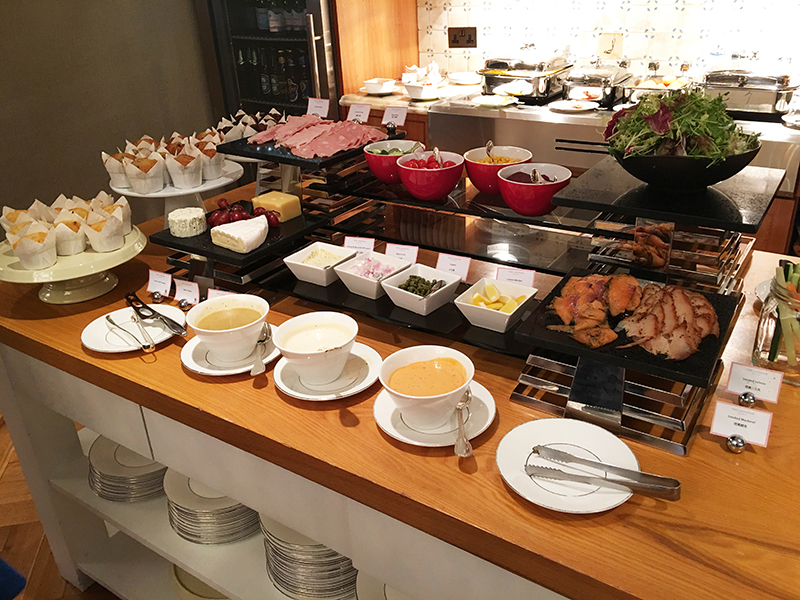 The Langham Club serves a full-on breakfast buffet each morning until 10:30 am, and also offers afternoon tea selections and canapés during cocktail hour in the evenings. Champagne, wine and cocktails are available all day long. 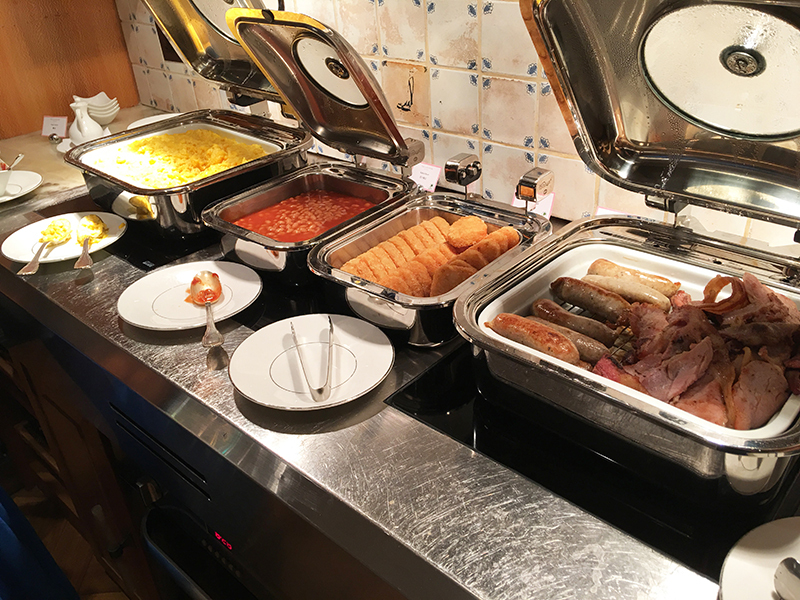 We really enjoyed starting off each day with breakfast here, as it has everything you could ask for: fresh fruit, cold cuts, salads, and a great selection of hot breakfast items like eggs and sausage. While kids are welcome to enter the club anytime up until 8 pm, we only saw one other family there during our stay, so the space definitely has more of a hushed, grown-up feel. 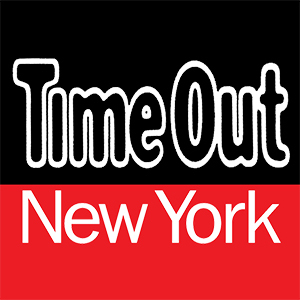 If your kids are on the rambunctious side, you might to limit your time here. While our girls are pretty well-behaved, they do have their um, “high-energy” moments. So to be considerate of the other (adult) guests who wanted a quiet place to enjoy their meal, we always tried to sit in an empty section. With all that said, the staff at The Langham Club always made our family feel welcome. 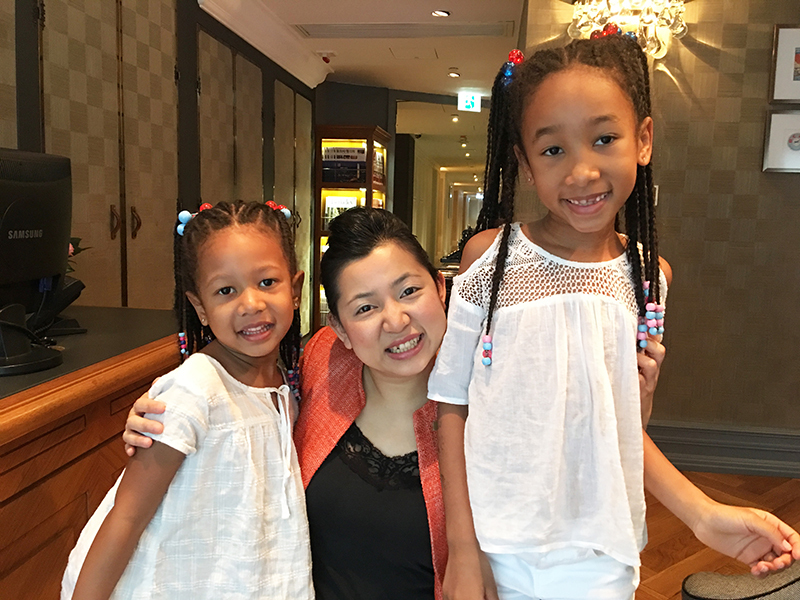 Noel, the hotel’s head butler, especially went out of her way to take great care of our girls. One late afternoon, we had stopped into the club for a cocktail before heading out to dinner. Noel came by our table to say hi and noticed that Ella, our youngest, was looking a bit glum. Noel asked her why, and Ella replied that she was feeling cold. Noel immediately went to turn down the air-conditioning, and returned to surprise our girls with two mugs of hot chocolate. Needless to say, they were thrilled. 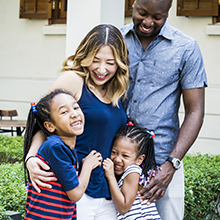 It was these kinds of small, personal touches that made our family feel so at home there. 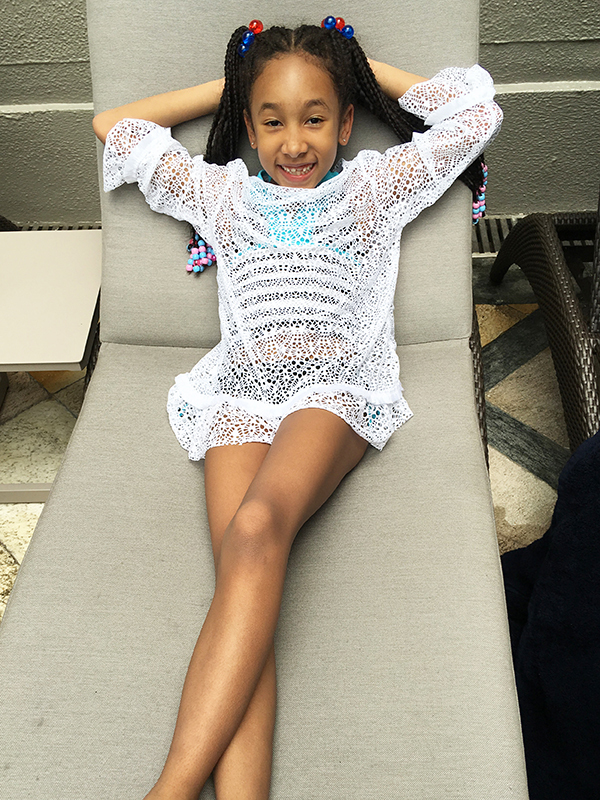 Over the years, I’ve seen that there’s a big difference between hotels that tolerate children, versus hotels that actually welcome kids. The Langham, Hong Kong is firmly in the latter camp. 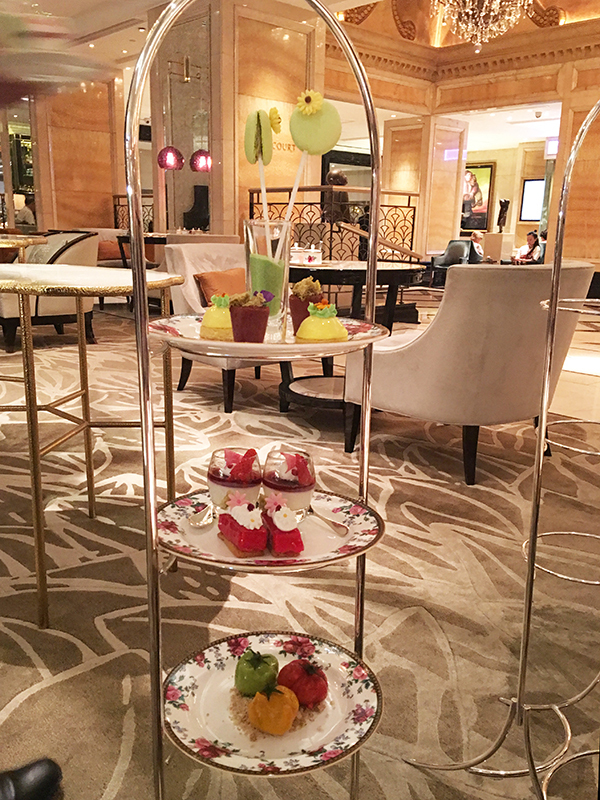 One can’t-miss experience The Langham offers is its afternoon tea service at The Palm Court, the hotel’s lobby lounge. 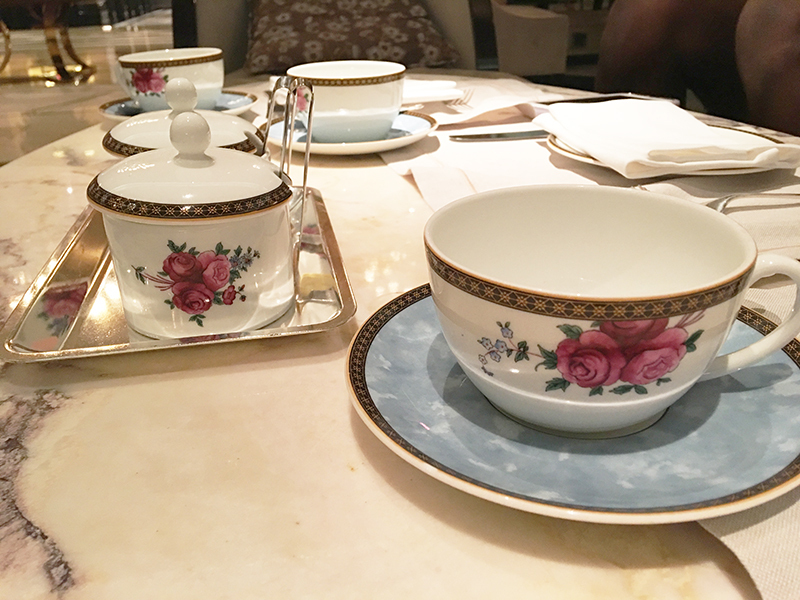 Not only is the afternoon tea served on Wedgwood tea ware, The Langham has actually partnered with Wedgwood to create its own tailor-made “Langham Rose” pattern. So these pieces are truly one-of-a-kind. The hotel often changes its afternoon tea themes. During our stay, they offered a spring-themed “Blooming Afternoon Tea” where the pastries were meant to mimic a bouquet of flowers. The pastries were delectable, and included a pistachio and white chocolate macaron, a vanilla panna cotta with rose and strawberry mousse, a fruity dome of yuzu mousse, apricot jam and lemon biscuit, a sablé breton topped with raspberry mousse and Chantilly cream, and a bite-sized chocolate “flower pot” with Gianduja cream. The bottom tray contained the savory items, meant to mimic a tomato patch. They had fillings of smoked salmon and cream cheese, chicken with Dijon mustard, and green pea hummus with sesame paste. 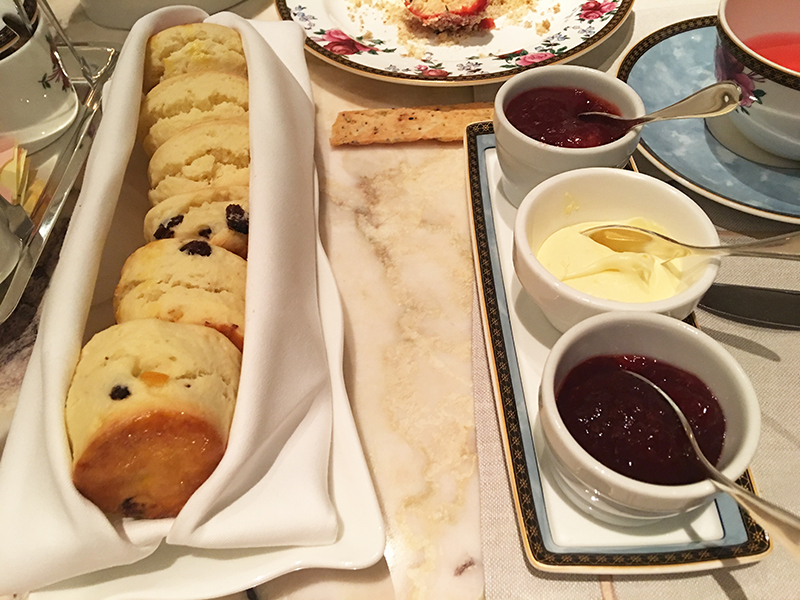 The scones were served with Devonshire clotted cream, strawberry jam and rose preserve. 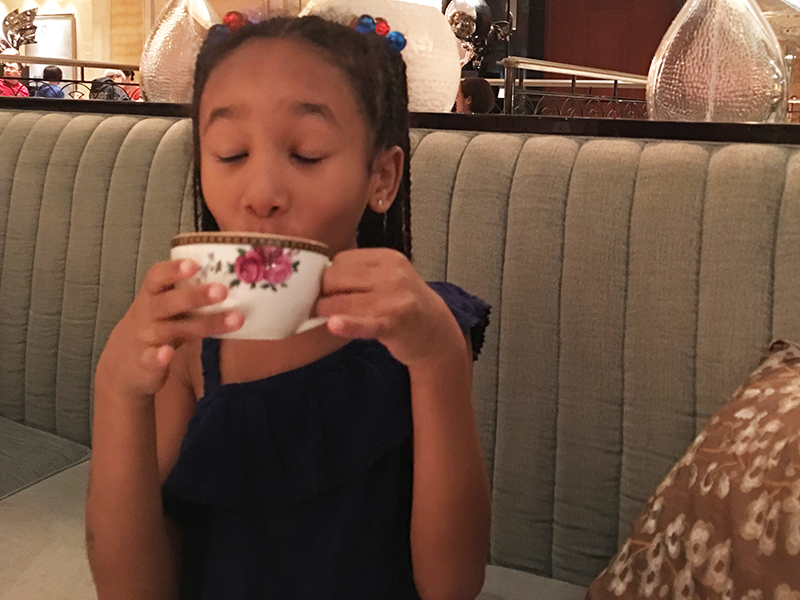 Our girls loved the experience, and especially enjoyed the kid-friendly strawberry and kiwi tea we ordered. 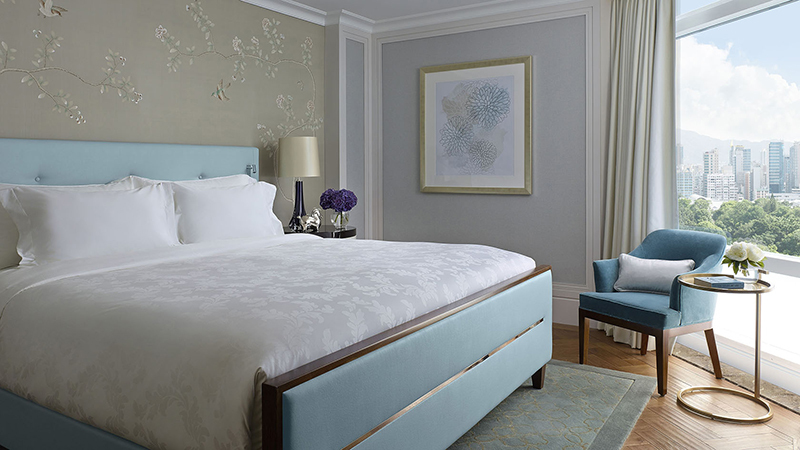 The Langham is a great place to stay if wellness is a priority for you. 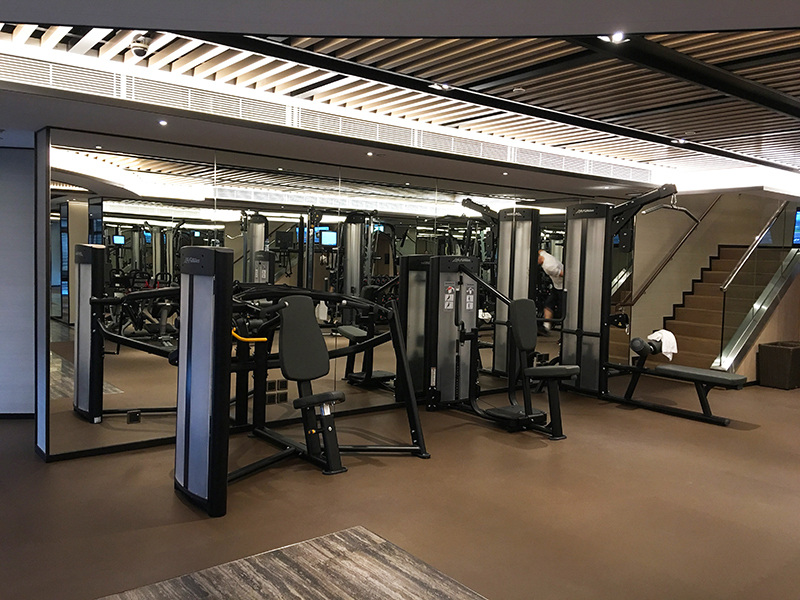 In addition to a spacious gym, the hotel has a spa and an outdoor pool and hot tub. I’m glad our girls had a place to burn off some energy. They love swimming, and this outdoor pool fit the bill. 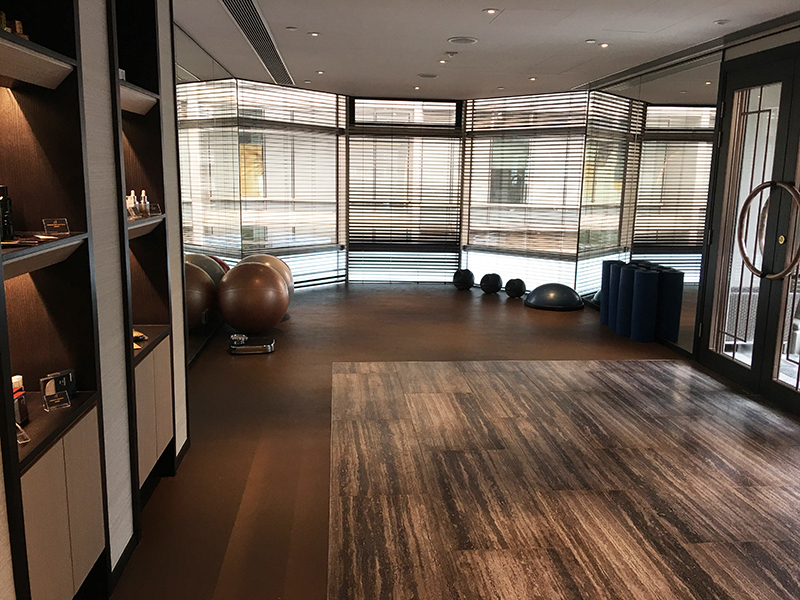 The Health Club at The Langham is very well thought-out. The main floor has a large stretching area stocked with stability balls and Bosus. It also has a sizable weight training area, with a mix of free weights and machines. 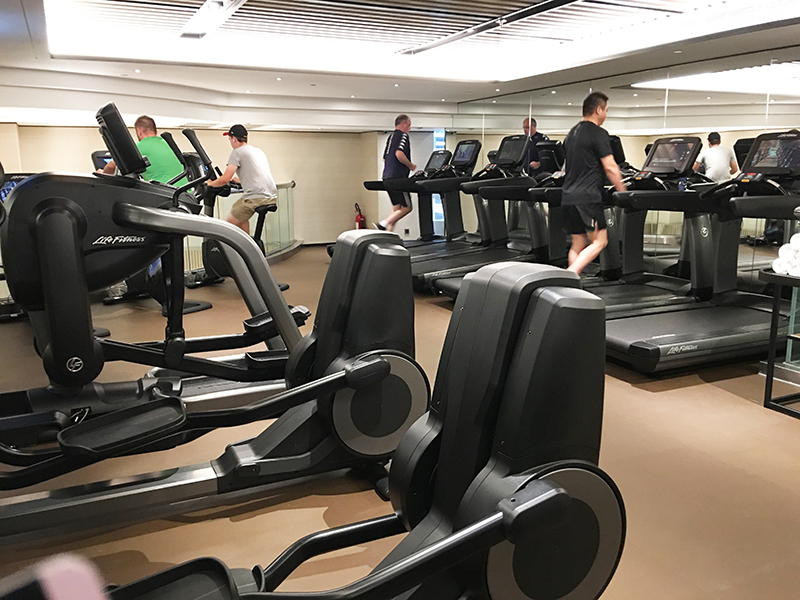 One floor up is the cardio area, equipped with treadmills, elliptical machines and stationery bikes. 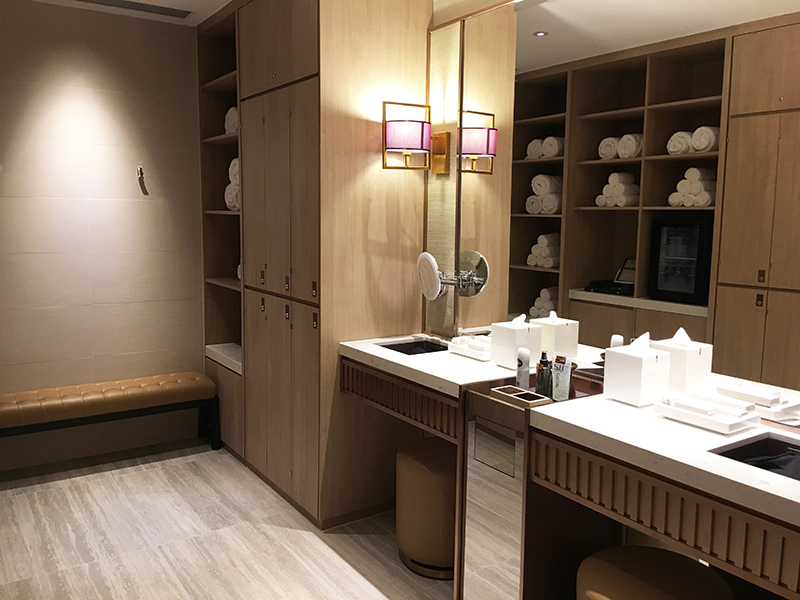 The hotel also has a small but serene spa called Chuan Body + Soul that offers treatments based on the Chinese philosophy of the five elements—wood, fire, earth, metal and water. 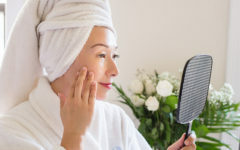 The hotel has a variety of dining options, but probably its best-known eatery is T’ang Dynasty, a three Michelin-starred Cantonese restaurant. 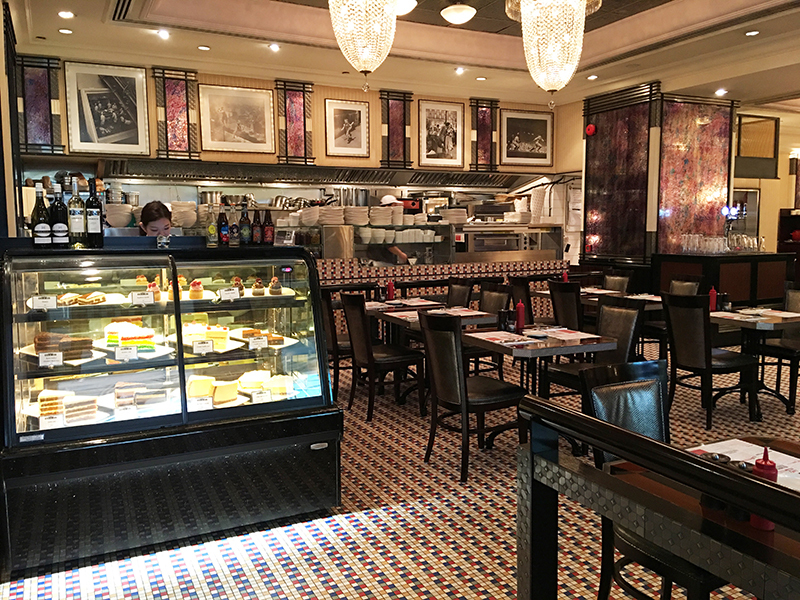 If you’re in the mood for comfort food, you can stop by Main St. Deli, the Langham’s answer to New York-style delis. It serves everything from burgers to Reubens, from ribs to wings. 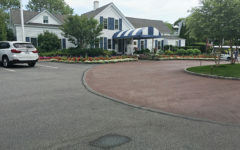 If you’re in the mood for seafood and steak, check out the Bostonian Seafood and Grill. 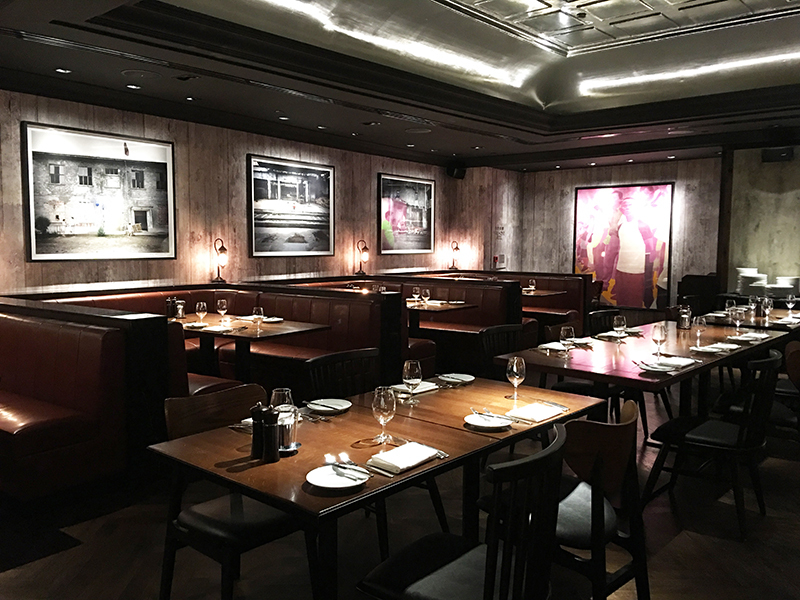 With is wood paneling and leather booths, this restaurant has a clubby feel and is know for its great oyster selection. Artesian, the hotel bar, is known for its Bourbon cocktails and its gin and tonic specialties. Connected to Artesian is Palm Court, the hotel’s lobby lounge. 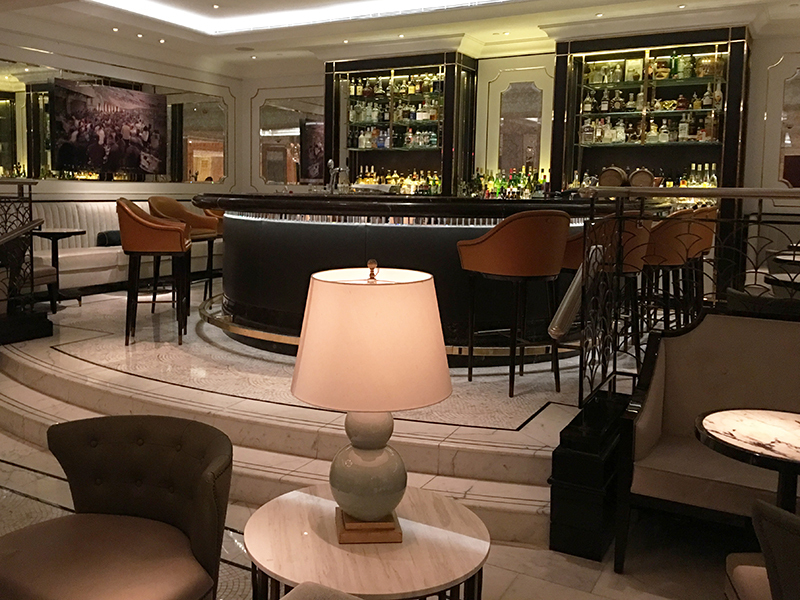 It’s a great place to enjoy live music with your afternoon tea or cocktails. 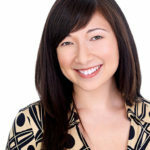 A harpist performs in the afternoons, while a piano and vocalist sing standards in the evenings. Hong Kong has a lot of mega-luxury hotels. 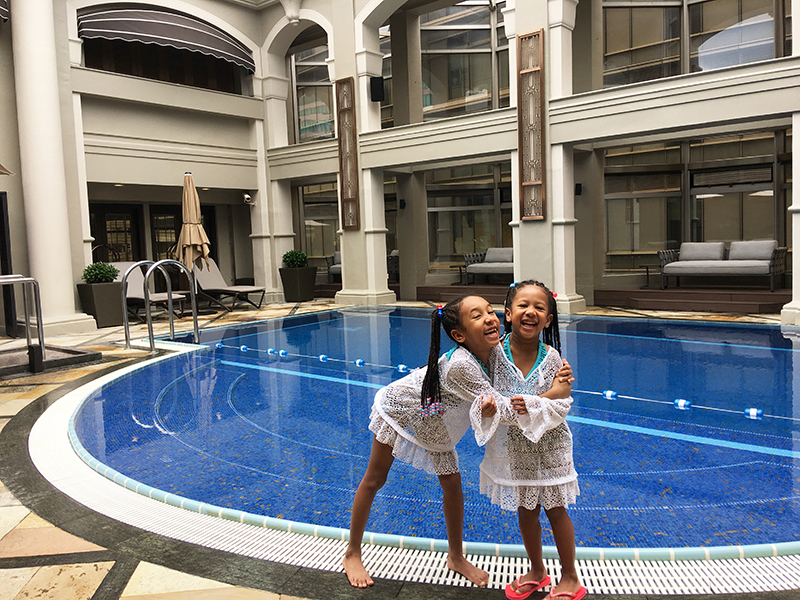 But if you’re looking for a hotel with more subtlety and grace, The Langham, Hong Kong is a great pick for families. 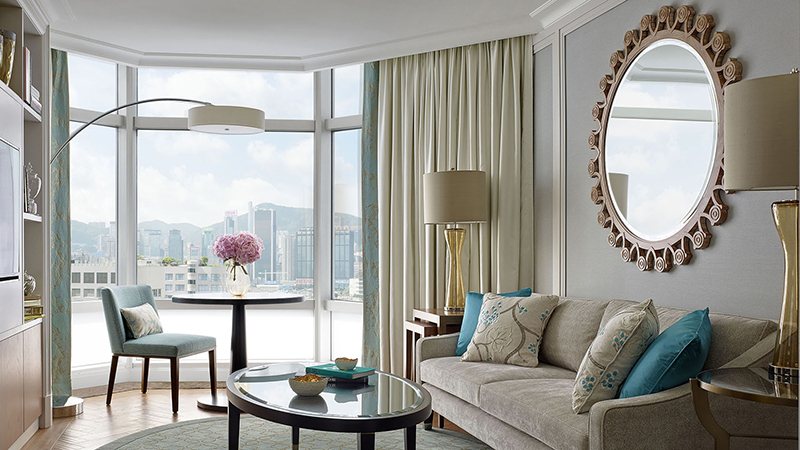 The author received complimentary accommodations and meals from The Langham, Hong Kong for purposes of this review. All opinions are her own.